Being able to graduate from university with a qualifying law degree but also have qualifications in business is what attracted me to NTU. I attended a Nottingham Trent University (NTU) open day with my parents once I received a conditional offer to study at Nottingham Law School (NLS). Walking around the City Campus, students seemed friendly and the facilities were very modern. I attended a lecture which provided prospective students with more information on what could be expected from the course. What appealed to me, was that university lecturers spoke at length about what NLS can offer me and how I can develop personally as an individual. After listening to a current student talk about his experience, I knew that NLS was the right choice. My route into university was through A Levels in both business and law. I enjoyed the intellectual challenge that both subjects provided me with and wanted to combine both to give me a broader and more unique degree. NTU offered me this opportunity. It was a key feature which not only attracted me to the course but also to the university, because it wasn’t a course widely offered across the country. Being able to graduate from university with a qualifying law degree but also have qualifications in business is what attracted me to NTU. Particular modules that I’ve enjoyed so far include law of trusts, land law and company law. The law of trusts was challenging with complex legal principles. I studied the module in three months and achieved a 1st class mark, something I’m personally proud of. Land law is a module that is practical, where many of the principles will be applicable later in life. 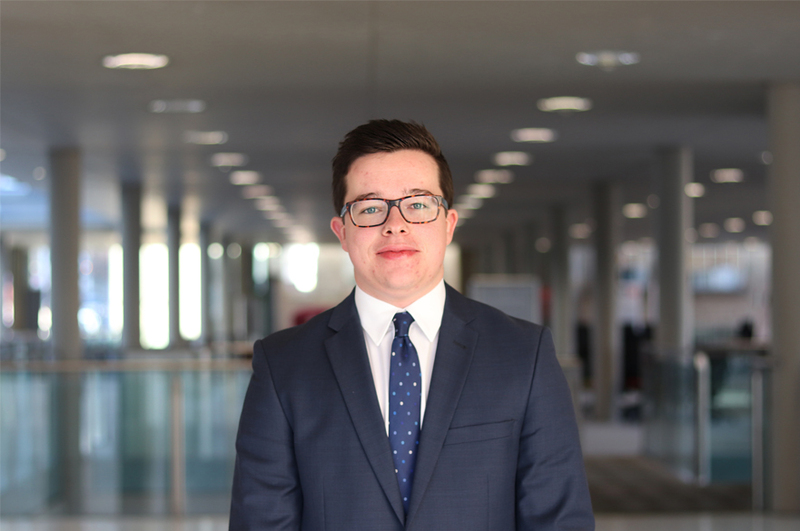 The module encouraged me to find full time legal work experience in the Real Estate and Finance sector at a national law firm for nine weeks and reinforced the possibility of a future career in it. In the final year of my degree, I have chosen modules specifically focussed on business law. Modules such as company law and international competition law are current within the news and makes applying those core principles interesting. Law is a subject that demands research skills and the ‘library one search’ facility certainly allows you to develop this. With access to thousands of materials, I have the flexibility in reading online e-books or journal articles related to the specific topics I’m currently studying. Something that I find particularly useful, is being able to review the return dates on any loans I have open with the option to renew them online. The library also sends helpful reminders when a loan is nearing its expiration date, so I don’t accrue fines. On balance, the library is a really useful resource that has helped me progress smoothly through my undergraduate degree. Since attending university, I’ve grown not only academically but also personally. At the beginning of my second year, I became actively involved with the law school’s employability centre. Working closely with Ed Mosely and Melanie King, we have been able to establish initiatives such as the NLS Employability Newsletter, delivered to students by students. The idea came to me after attending NationalLawLive 16. I wanted to establish a newsletter that helped students pursue a career in law. The focus is to provide NLS students with advice and help on application forms and how best to maximise their potential in front of recruiters. Topics that are frequently covered include Nottingham Law School’s annual law fair and the recruiters that attend. The newsletter has also included one-to-one interviews with well-established legal professionals that have spoke about their experiences and offer their advice to current NTU students. The newsletter has been a success, where a personal highlight for myself was being invited to the NLS celebration evening and presenting the newsletter in front of the Dean and other legal academics. I have become more confident in talking to a variety of people and have expanded my personal network in the process. This year, I have assumed other roles in the law school. My role as a CERT mentor is to mentor 14 first year LLB Business Law students, providing support and guidance where necessary. The role allows me to reflect on how I handled certain situations that first year students find themselves in now. Furthermore, I was elected by my course this year to represent their voices at a higher level. Attending both course and school meetings, I engage with any issues or amendments that need to be made to the course and offer my opinion on how successful events have been in the past. My plan within the next 12 months is to progress onto the Legal Practice Course. Following that, my long-term ambition is to become a qualified solicitor in a national firm, with the ambition to experience international law as well. With the skills and qualities that I have already established at NLS and look to develop in the future, I aim to make a positive impact on the legal sector over the coming years. I would like to take this opportunity to thank NLS for providing me with this opportunity to establish the foundations of my legal career and the success that the university has brought me.